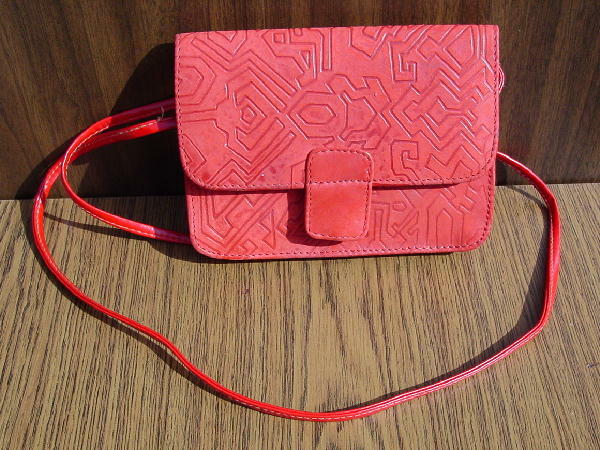 This watermelon red leather purse has a 52" long shoulder strap which can be untied and the purse carried as a clutch. There is a built-in mirror on the inside of the front flap. It was made in India. It has a snap-tab closure, and says "genuine leather" on the outside side under the strap. It has 2 interior sections - a smaller front open one and a larger one with a black fabric lining and an interior zip pocket. The exterior has geometric figures.